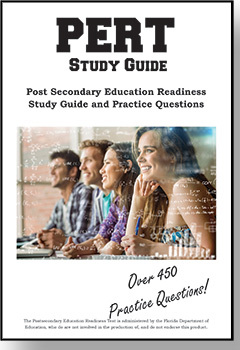 The Post Secondary Education Readiness Test (also known as PERT) is a placement exam for high schools in Florida. This test measures your academic skills in writing, math and reading. The test is designed as an adaptive computer based test to determine if a student is qualified for college or needs development course programs. It was designed by McCann Associates with help from Florida educators in October 2010. It is now used as a placement test by state and community colleges and technical schools in Florida. There is no PASS or FAIL. It’s a placement test, so the results determine what courses you should take to optimize your academic career. This test is Florida’s common placement test. Is a multiple-choice computer-adaptive test, applied in 11th grade and used by all 28 members of the Florida College System. The main purpose of the PERT is to review academic skills and your readiness for college level courses. Not all students are required to take all three subtests. Which subtests you take depends on your circumstances and the requirements of the College you are applying to. The difference between the PERT and other placement tests is the PERT was designed for Florida’s educational regulations and the specific needs of the state. The Pert test is offered as a walk-in-test at the testing centers of Florida colleges. Check with your college for instructions on how to register. For those students getting into college for the first time that hadn’t taken a placement test before there is no fee. For those retaking the test there is a charge, which depends in the policies of your college. The test has three sections, which are Writing, Mathematics and Reading. The test is computer based and adaptive. This means the computer determines your next question based on your answer to last question. Here are some tips for computer adaptive exams. For more tips, see our Test Tips. There are a total of 30 questions in every subtest; 25 questions are scored for your total placement score, and 5 questions are not graded. These questions are used to improve the test bank for future tests. Important to do your best in all questions, because you won’t know which the field test items are. The test is not timed, as with most adaptive tests. The only calculators allowed during the test are the ones that appear on screen in the math section. Dividing by monomials and binomials. Applying standard algorithms or concepts. Focusing on pairs of simultaneous linear equations in two variables. Discerning and summarizing the most important information. Supporting or challenging assertions about the text. Determining the meaning of words in context. Sustaining focus on a specific topic or argument. Establishing a topic or thesis. Supporting and illustrating arguments and explanations. Developing and maintaining a style and tone. Representing and accurately citing data and opinions of others. Grammar, spelling, capitalization and punctuation skills. You cannot fail the PERT because it’s a placement test. The score is used to determine if you are ready for college and what areas you may need some extra help with. The scores ranged from 50 to 150. The approval score is determined by the level of difficulty of the test. From 50 to 95 for the Lower Level Developmental Education. Between 96 and 112 for Higher Level Developmental Education. 114 to 122 for Intermediate Algebra. From 123 to 150 for College Algebra or higher. 50 to 83 for Lower Level Developmental Education. From 85 to 103 for Higher Level Developmental Education. And from 106 to 50 for Freshman Composition Skills I. 50 to 89 for Lower Level Developmental Education. From 90 to 98 for Higher Level Developmental Education. And 103 to 150 for Freshman Composition Skills I. The best test prep tip is start early! Build up study time – start with a short study period and increase the time each day. The most powerful multiple choice strategy is elimination – quickly eliminate choices that you know are incorrect – then concentrate on the other choices. More on how to answer multiple choice questions. Pass the PERT on the First Try!